A Delicious Slice of Johnners. 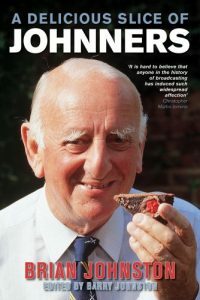 Edited and introduced by his eldest son, Barry, A Delicious Slice of Johnners is a wonderfully enjoyable compendium of three of Johnners’ best-loved books, the autobiographies It’s Been a Lot of Fun and It’s a Funny Game, and Rain Stops Play, a collection of his favourite anecdotes, jokes and stories. Here are the highlights of an extraordinary broadcasting career. The great state occasions such as the funeral of King George VI and the Coronation, the royal weddings of Princess Margaret and Princess Anne, and the Queen’s Silver Jubilee. From his early radio success in the forties on In Town Tonight to the final critical and public acclaim on Test Match Special. Here too are all the famous gaffes, practical jokes and leg-pulls.